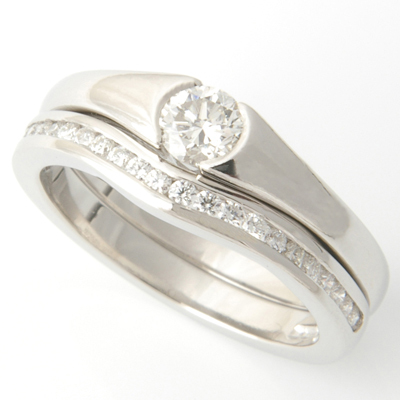 Platinum Half Eternity Diamond Set Fitted Wedding Ring — Form Bespoke Jewellers Ltd. The team at Form Bespoke Jewellers have created a beautiful wedding ring which fits perfectly against the profile of the customer’s engagement ring; a half eternity diamond set fitted wedding ring! The addition of 25 x 0.01carat diamonds of G colour and VS clarity adds a new dimension to the design of the solitaire diamond engagement ring. Each stage of the fitted wedding ring process ensures that the two rings sit together perfectly, no matter how complex the design. Plus, all work takes place at our studio in Chapel Allerton. Even if you did not get your engagement ring from us we can still help to create your perfect fitted wedding ring.